Fleur d’Andeol offers the option of converting any of our antique sheets into a luxurious, unique, and custom made comforter cover. We provide the highest quality in craftsmanship as well as an equally high quality of fabric and materials for the construction. Unless otherwise specified, we will match the particular fabric of the sheet, whether it’s made of linen, cotton, or a linen/cotton blend, to the fabric of the bottom portion of the envelope. The embroidered expanse, which normally as a sheet appears at the head of the bed, will figure in the lower portion of the duvet cover such that the area from the middle of the bed to the foot of the bed will display the decoration and/or monogram. Our duvet covers are created with a widthwise panel of 7-10 large mother-of-pearl buttons on the underside of the cover near the foot of the bed – very much in the spirit of the button panels on our pillow shams. Of course, as these duvet covers are custom made, we can accommodate your individual needs and wants. 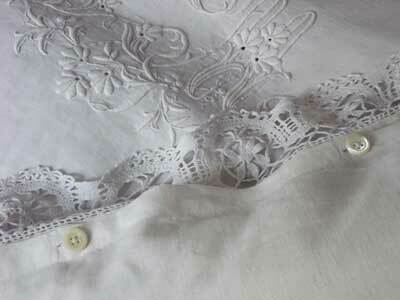 So, for example, you can choose a linen sheet but have the backing made in cotton. Or, if you prefer ties to buttons, these can be substituted. Wherever we can, we will try to accommodate your suggestions. King Size Beds: In general, antique king size sheets are rare as hen's teeth. However, most of our queen sheets can be custom made into a king size duvet. We maintain an ample stock of antique linen in a wide range of tones and textures which we use for such alterations so that the finished piece is faithful to the original piece in its design and construction. If you have questions about the dimensions and fit for your particular bed/duvet, don't hesitate to contact us and we will be happy to work out the details with you. To buy a duvet cover, choose from our catalogue of antique sheets. You will be given the "duvet cover option" before adding your sheet to the shopping bag. The total price of your custom duvet cover includes essentially the price of the top sheet plus the cost of materials and labor to transform it into a duvet cover. Assume two to three weeks from the time of your order to the date of your shipment.